This past January I accepted an invite to a wine and painting party. As an artist, I have always had trouble staying on the main stream path of coloring in the lines. I think it is just in my basic make up. 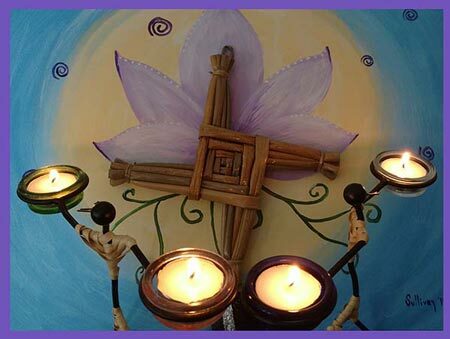 When I had seen the invite with the picture we were to paint, I thought, what a great idea for the backdrop for my Imbolc altar (a fire holiday held February 1st). Except, of course, I didn't like the color choices. 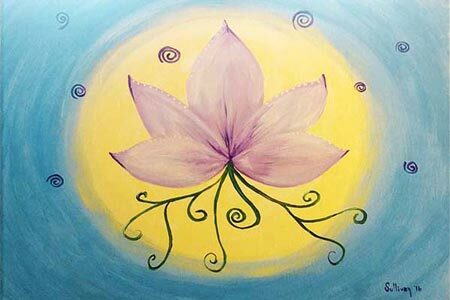 I chose to go any way because I liked the idea of getting together with a bunch of people, drinking wine and painting. So, my first question to the gal in charge was, "Can I pick my own colors?". She replies, "Oh, you must be the artist!" Now years back, I would have felt uncomfortable after hearing that and felt very much like, wow, now I really need to do something awesome ... like a real artist. But age has tempered me and my desire to impress anyone. I replied that yes, I was an artist, and I had just hoped I could use a different color pallet is all. She accomodated me with some blue. I was happy. What the most important lesson for me in this, or maybe better put, the aha moment, was when I realized that I really did not care what she might have thought about what I was going to do. Or, in knowing I was an artist, what any of the others might have thought or expected. In the past I would have been all over second guessing about what someone thought. I no longer cared! I had not picked up a brush in a few years, I just wanted to paint a picture for my altar. It didn't matter if anyone liked it or not as long as I was happy with its outcome. So, I mainly (said with a little giggle) stuck to the theme, but did it my way. It looked beautiful on my altar and I even posted it on my social media. When we create something, it stokes our inner fire and we can't help but want do more. I have come to find it really may not be the outcome, even if I am really happy with something. It's much more. It's all the inner thoughts and how I feel doing it that make getting to completion extremely rewarding and fullfilling. And this can be applied to even simple, every day tasks we perform. Yes, even folding laundry or making a meal can be a creative and rewarding experience if we take the leap and color outside of the lines. So, after all this, I guess I should show how I used my finished piece. It really was a lovely back drop on my Imbolc altar. And, when I look at it I am reminded of the night I created it, the new people I met, and the overall enjoyable experience it was.